Through the collaborative efforts of the award-winning design-build firm of Realty Restoration, LLC and the interior design firm of Twelve Stones Designs mountains of design hurdles were overcome on this Westlake Hills home. Now the envy of the neighborhood, awe-inspiring architectural elements, exquisite materials and custom finishes showcase the thoughtful design and careful attention to detail labored over this massive remodel undertaking. Stand out rooms in this home include the Gourmet Chef’s Kitchen, the Entertainer’s Delight Bar and Living areas and a true Master Bathroom Retreat. Exquisite craftsmanship and creative applications of materials make this extensive remodel well worth a long pause on this year’s tour! When the owners of this 20 year old home came to us with a lengthy wish list of items for their remodel the adage “the kitchen is the heart of the home” couldn’t have been more true. Among the requests were a gourmet kitchen housing commercial appliances, an island that could seat 10, a bar area deft enough to hold generous quantities of libations and their appropriate dressings and serving vessels, and multiple entertaining areas that all relate back to the kitchen. 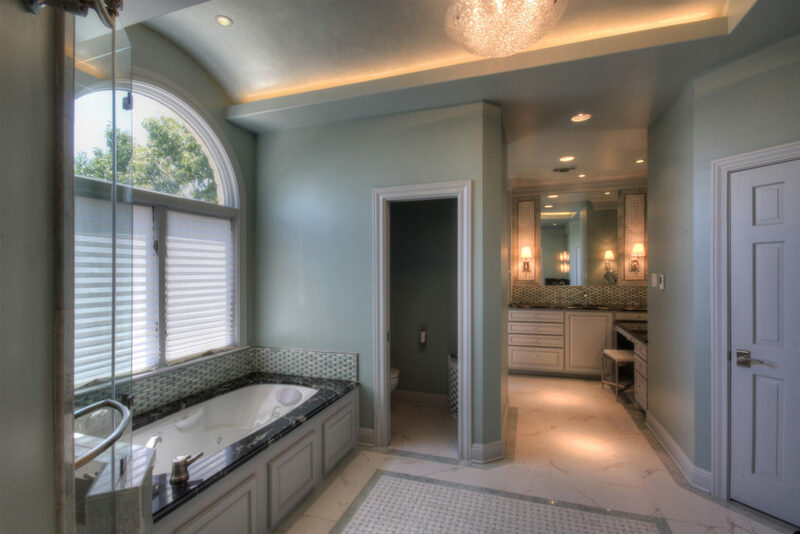 Later in the project a luxurious master bath would present and include a ladies vanity retreat which would rival the grandness of the finishes in the kitchen. The challenges brought to the table both structurally and aesthetically, were numerous. The homeowners’ foremost desires were to update the old kitchen to accommodate for the husband’s passion for cooking and to utilize areas from surrounding unused rooms to integrate a space for frequent, large gatherings. 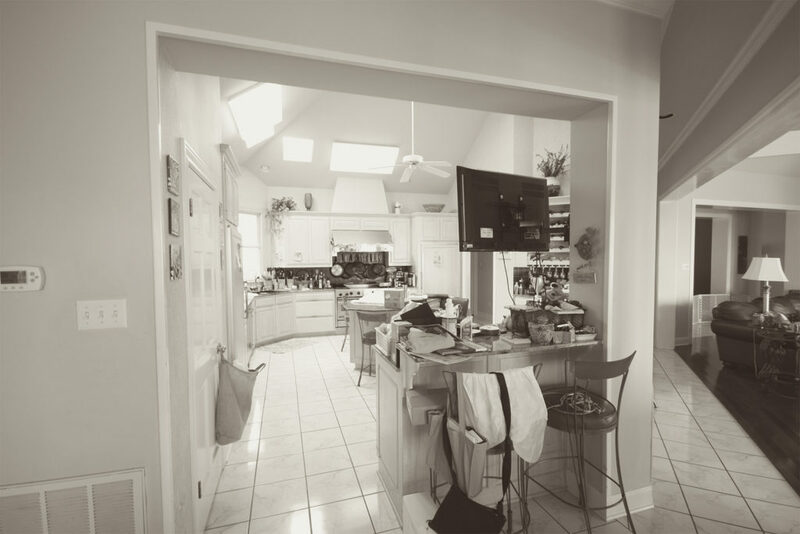 The original kitchen, while possessing adequate square footage, housed awkward angles, multiple entrances and an ill-placed center island which crowded all of the work zones to one side of the room. Guests were either ostracized to a dark, crowded breakfast nook closed off from the kitchen and living spaces or relegated to an awkward hallway holding a pull-up bar which faced the backs of the hosts. After annexing space from an ancillary bedroom and opening up the pass-though bar, the first of many hurdles was to create a cohesive space by constructing a 135 degree angle barreled ceiling utilizing the angles of the existing floor plan and the existing peak of the roof line. 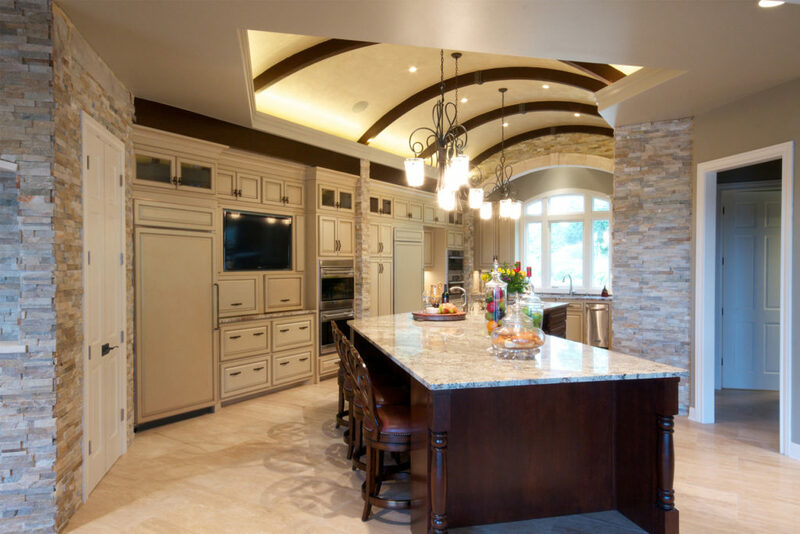 Indirect cove lighting now illuminates the massive, custom-made arched beams and makes the venetian plaster finish glow thus creating the new architectural focal point of the kitchen. The next obstacle was to address proper ventilation and placement of the commercial range top and broiler oven. A custom stainless steel shelf was designed to hold the broiler oven as well as provide an auxiliary exhaust path for contaminated air through slits on the underside of the shelf. Critical elements addressed in the construction of the cooking space were the tolerances beside combustible materials, proper ventilation, make-up air and overall esthetics. In order to accommodate a kitchen with over a dozen major appliances including a 60″ Blue Star rangetop, a Blue Star Salamander broiler, a Miele Steam oven, Subzero Refrigerator and Freezer, and Wolf ovens, just to name a few, careful space planning and application of the NKBA Guidelines were exercised to keep reasonable work triangle dimensions and create efficient work zones. Detailed lists and measurements of the kitchen’s contents were thoughtfully considered in the placement of storage next to the appliances to minimize distances from each work zone and its appropriate devices. To address the clients’ request to create a kitchen that accommodates their large family and many guests yet not interfere with the cooking or clean up activities, a expansive island was designed. Mirroring the angle of the barreled ceiling the island has a dual purpose, acting as a work space on one side of the angle and a communal gathering space on the other. Furthermore, adjacent areas were reconfigured to relate to the kitchen proper in order for guests to participate in activities from any part of the main living spaces. The once cramped breakfast nook is now a chic wet bar complete with icemaker, 30″ Subzero Wine refrigerator, extra deep liquor bottle drawers, and a whimsical martini olive bar faucet. A large portion of the wall separating the nook from the living room was removed alleviating the bottleneck of traffic off the patio and allows for more natural illumination from the bank of windows in the living room. Opposite the bar area an expanse of built-in cabinetry provides storage for glassware, serving items and to display the homeowners’ compendium of recipe books, novels, publications and the like. A planning desk was also included for daily activities such as checking email, planning menus and paying bills. Balanced by the symmetry of repeated lines, materials and finishes, there is now continuity between the kitchen and multiple living spaces. The perfect marriage of color, texture and lighting now create a backdrop for this entertainer’s paradise. Where there once was a conglomerate of closed off rooms, now exists a unified space that all relate back to the heart of this remodel: the grand gourmet kitchen. 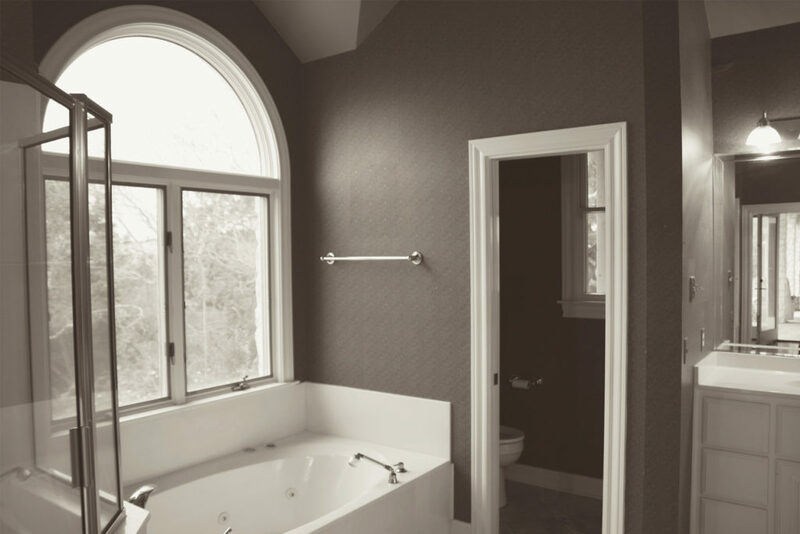 In order to create fluidity in the over all design of the home another barrel vault was constructed in the master bath over the tub area. Once again working with the home’s existing framing was a challenge. While most of the fixtures remained in place the shower and tub areas were updated with spa like features such as a rain shower head, body sprays and a jetted tub. Natural stones such as Blue Fantasy granite, Ming green and Thassos marble in elaborate designs were also incorporated into the new space for a 5-Star hotel atmosphere. To address the water damage issue at the men’s vanity, an elevated cabinet height was specified in conjunction with a wider lavatory sink, taller faucet and 9″ high granite backsplash. This would reduce the “splash” issue eliminating water damage due to the husband’s tall stature and distance from the water source to the face during grooming exercised such as shaving or face washing. Light fixtures flanking the sides of the mirror now allow for proper task lighting when grooming as well. Formerly located at the “hers” vanity area is now a quaint arched hallway linking the bath area to a woman’s retreat. A small room was added on to the existing space to provide a private grooming space for the lady of the house. Featuring an appliance garage, seated makeup vanity and plenty of storage, this room is packed with natural light which is reflected in the large mirrored walls and accented by the intricate tile designs. All in all, this remodel is a prime example of the metamorphosis of a humble house emerging as an exquisite home. A fortunate couple’s long awaited and much anticipate dream actualized.